Cued Ballroom (“Round Dance”) is ballroom dancing with a twist – the dances are pre-choreographed and a “cuer” announces the steps as the dance proceeds. Freed from memorized sequences and the complexities of leading and following, the dancers can focus on the steps and the rhythm while enjoying professional choreography. It really is an easy and fun way to learn and enjoy ballroom dancing. The Sacramento Cued Ballroom Dance Club meets every Tuesday evening at Community of Christ Church, 4044 Pasadena Ave, Sacramento, CA 95821. The IAGSDC supports gay and lesbian Modern Western Square Dance (MWSD) clubs worldwide, including the United States, Canada and Japan. Our organization was formed by and for lesbians and gay men and for their friends. You do not have to identify as gay or lesbian to dance with an IAGSDC club. Membership is open to all square dancers. All IAGSDC clubs dance the Callerlab specified levels of MWSD. The Main Street Strollers Square Dance Club meets every Thursday night at the IOOF Hall, 467 Main Street, Placerville, CA 95667. We dance 6:30 pm – 9:00 pm. with 1 round between tips. We dance Plus squares and Rounds. Our caller is Scot Byars and our cues is Erin Byars. The Goldancers of Nevada City Square Dance Club meets every Thursday night at the Golden Empire Grange, 11363 Grange Ct, Grass Valley, CA 95945. We dance 6:00 pm – 8:30 pm. except on the first Thursday of each month when we dance from 6:30 to 9:00. We dance New Dancer, Mainstream and Plus. Our caller is Tom Kaiser. We dance Fun Plus 7:00 pm – 9:00 pm. For more information call Mark Chase, 530-305-5423 or find us on Facebook at www.facebook.com/buttonsnbows15/. The Oroville Promenaders Square Dance Club meets every Wednesday night at the Oroville Centennial Cultural Center, 1931 Arlin Rhine Memorial Drive, Oroville, CA 95965. We dance 6:30 – 8:00 pm (New Dancer) and 8:00 pm – 9:30 pm (MS & Plus). The Capital City Squares Square Dance Club meets every Wednesday night at the Fruitridge Community Center, 4000 Fruitridge Rd., Sacramento, CA 95820. We dance 6:30 pm – 9:15 pm. We dance New Dancer, Mainstream, Plus, and Advanced. The Apple Jacks and Jills Square Dance Club meets every Wednesday night at the Hangtown Grange Hall, 2020 Smith Flat Road, Placerville. We dance 7:00 pm – 9:30 pm. We dance Mainstream and Plus. Our caller is Paul Moore. The Prime 8’s Square Dance Club meets every Monday night (except 4th week or holidays) at the VFW Hall, 905 Drever St, West Sacramento, CA 95691. We recommend you call first to be sure we have 8 dancers for your specific date. Our caller is Del Powell. 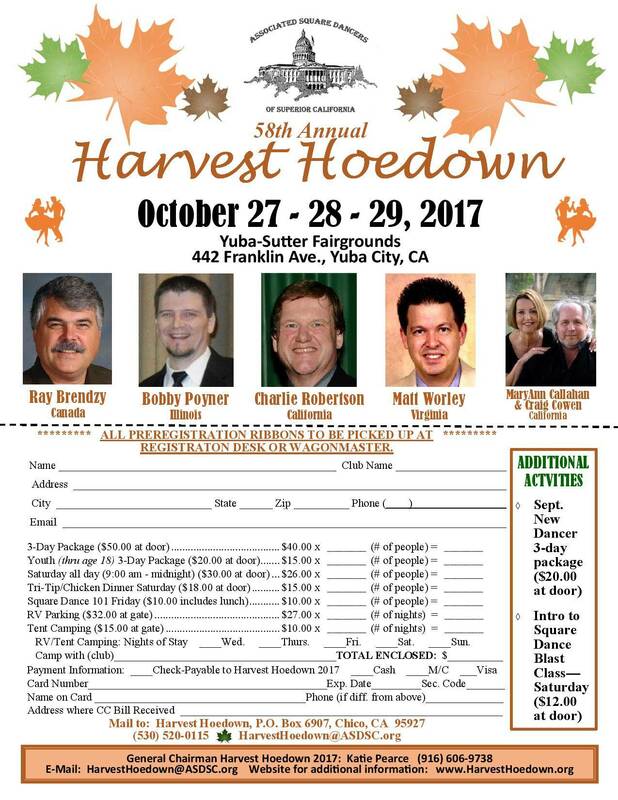 If you would like to download and mail in the Harvest Hoedown Registration Form.